You already know that visualizing yourself at your healthy weight is a good thing. And no one says it isn’t hard. You bet your booties it is hard. But it makes it a little easier if you can make a record of all your accomplishments. Seriously – You know this! People who take the time to document their successes and analyze their setbacks have 10,000 times the chance to succeed. Scrapbooking your weight loss is just a really good idea. Autumn Craig – Professional scrapbooker and author of several books health and wellness coach, personal trainer and nutritionist, know its a good idea too. 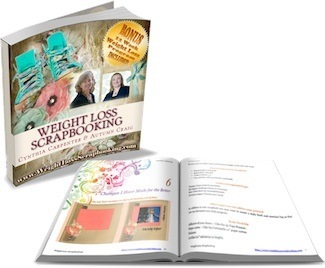 They pooled together their resources and knowledge to make a colourful and meaningful book that you can use to help meet your weight loss goals.